Does anybody have some pictures of what the structure of the inner wheelhouse looks like? Basically the structural elements of the hell hole. There a piece on the inside that reinforces it, there is the jack receiver plate, there is the joint between the inner long and the wheelhouse. There are so many thing overlapping right there and mine is so far gone I can't really tell how it was actually constructed. And exploded view would be awesome. I didn't see one in the shop manuals. A picture of what that area looks not all rusted away would be great too so I can see what it's supposed to look like when all fits together. I looked at restoration design and the picture they have of their replacement part but by feeling the inside of that area on mine seems to be constructed differently than their replacement part. for example the hole you can see, there is another one just to the left of that one that is not on the RD part. Here is a picture from my car of the area I am talking about. 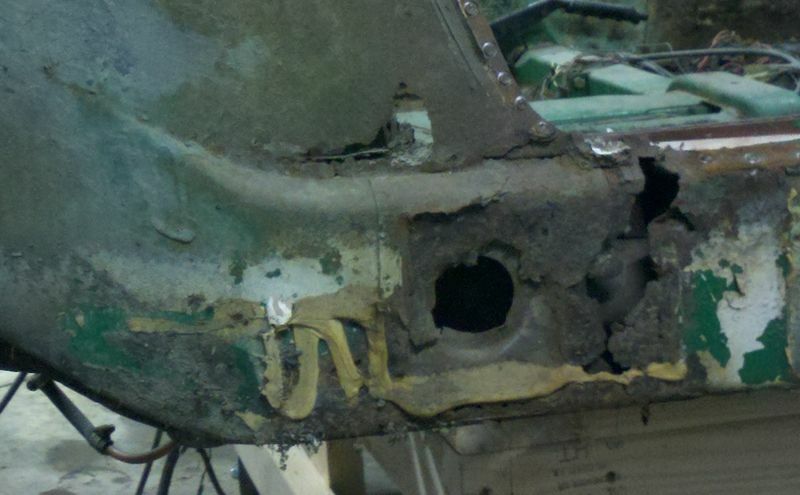 I have ground all the adhesive, paint and rust out of the area to see what is going on. Don't have a picture. That gave me a little better understanding. The next step is I am going to carefully try to cut out the rust on each layer, pulling that layer off to see what I can find.